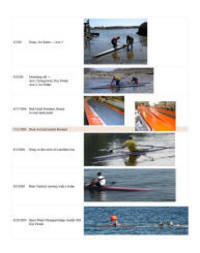 The 5th Annual Row Expo is the major Northwest boat show catering to the sliding-seat rowing enthusiast. See the widest selection of recreational and open-water rowing shells and accessories. Talk to the experts. Conveniently held in Bellingham between Seattle, WA and Vancouver, BC. Echo Rowing will be on hand at the event for rowing demos. 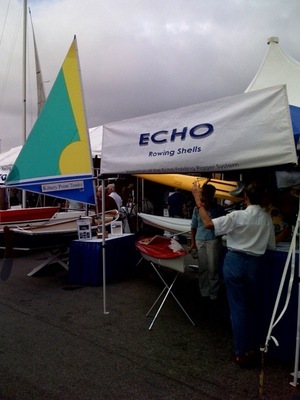 Echo will be represented at the Providence Boat Show, starting Thursday, January 11 and running until Sunday, January 14th. Southport Marine will be representing Echo Rowing and will be in the Dunkin Donuts Center upstairs at Booth C112N. Look forward to having you all visit !! Echo Rowing designer Doug Martin continues to capture headlines with his innovative designs, not only in recreational rowing shells, but also in violins. November 28th, the NY Times featured his story and he has since appeared on the New England Cable News. Today, the story continues as Doug is featured on the front page of the Portsmouth Herald newspaper. When asked about his designs in the violin world, Doug replied, " The weight of the last 300 years on violin makers is heavy, but the weight of the future is infinitely heavier," Martin said. "The possibilities are endless." View the latest article at the Portsmouth Herald website. After his recent fame via a NY Times article about his passion for violin building, Echo Rowing's designer, Doug Martin, was contacted by New England Cable News (NECN). Last evening, (11/29), NECN aired an interview with Doug that was filmed at the Echo Rowing office and boathouse. You can view the video on the NECN website by clicking under Features on Maine Man Combines Boats & Music. You can see an Echo Rowing shell in action as well as Doug playing his innovative Balsa #4 violin. Echo Rowing designer Doug Martin has been recognized for his unorthodox approach to violin design in an article posted in todays' NY Times. "String Theory: Accousticians Who Break the Rules of Instrument Design, " by Andrew C. Revkin can be viewed online at the NY Times website. While Echo Rowing owner/enthusiasts know Doug for his expert design in the world of recreational rowing shells, he has another passion that he invests his spare time in to- the accoustic world of violin design. 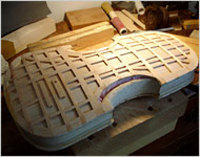 His approach by using balsa and graphite fibers is shaking the world of violin building. Revkin writes, "Mr. Martin, 63, whose day job is designing sleek rowing shells that slice through ocean surf, is consumed in spare moments by a similarly unorthodox pursuit: abandoning age-old norms of acoustic instrument design as he chases his conception of the ideal violin sound..."
** If you click on the Interactive Graphic on the left side of the story, and click the tab " Art of Science", you can hear an audio clip of Doug's violin being played. Pick up now or we will hold it until the spring. Lock in 2006 Prices & Enjoy a 10% Discount! The United States Sailboat Show in Annapolis, MD will be held from October 5 through October 9, 2006 at the Annapolis City Dock and Harbor. Echo Rowing will have a booth at this show. If you live in the area, or will be visiting- please stop by and say HELLO! On February 25, 2005, Bruce Schwab became the first American to officially finish the Vendee Globe Race*Solo*Nonstop*Around the world. Crossing the finish line in Les Sables d'Olonne, France just after 08:00 GMT, Bruce sailed into the history books as the first American ever to complete the grueling Vendee Globe. By completing the Vendee, Bruce not only became the first American to finish the race, but he also became the second American ever to complete a single-handed, non-stop lap of the planet. Abromson Center, USM Portland Campus.